With the Talk Abroad SIM Card for Cuba, we make international cellular service easy and affordable for anyone traveling to Cuba. The Talk Abroad Travel SIM for Cuba is compatible with any unlocked GSM cell phone with the appropriate GSM bands. The SIM card for Cuba has two phone numbers, a US based number as well as a UK based number. Both numbers are always active and do not require a monthly fee. Either phone number will ring to your phone while traveling in Cuba. While in Cuba with our travel SIM you can forward your US or Canadian number to the US number we provide. Or, you can give some of your contacts your new US number and other contacts your UK number. Adding additional talk time is a snap. You may opt for our "auto recharge" option which automatically keeps your credit above $10.00, or you can speak to a live US based rep, toll free, 24/7 while traveling in Cuba! You can even simply enter a 5-digit code on your handset to add additional call credit your Cuban SIM card account. The Talk Abroad SIM card for Cuba has a roaming relationship with Cubacel. 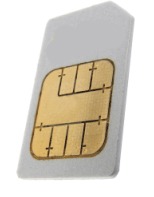 Our SIM card for Cuba is available in standard, micro and nano sizes. Most iPhone 4 and 4s as well as the Samsung Galaxy use micro SIM cards while the iPhone 5 uses the nano SIM card.